A lawful gift deed includes the grantor's full name and marital status, as well as the grantee's full name, marital status, vesting information, and mailing address. Vesting describes how the grantee holds title to the property. Generally, real property is owned in either sole ownership or co-ownership. For Indiana residential property, the primary methods for holding title are tenancy in common, joint tenancy, and tenancy by the entirety (I.C. 32-21-10-2). An estate conveyed to two or more people is presumed a tenancy in common, unless otherwise specified (I.C. 32-17-2-1). An estate conveyed to a married couple vests as tenancy by the entirety unless otherwise specified (I.C. 32-17-3-1). As with any conveyance of realty, a gift deed requires a complete legal description of the parcel. Recite the source of title to maintain a clear chain of title, and detail any restrictions associated with the property. In Indiana, the deed must be signed by the grantor and acknowledged by an individual authorized to take acknowledgements (I.C. 32-21-2-3). All signatures must be original. In Indiana, most conveyances of real property require a Sales Disclosure Form. Because a gift deed transfers real property from one party to another with no exchange of consideration, however, this type of conveyance is exempt. Record the completed gift deed in the recorder's office of the county where the subject property is located. Contact the same office to confirm recording fees and accepted forms of payment. 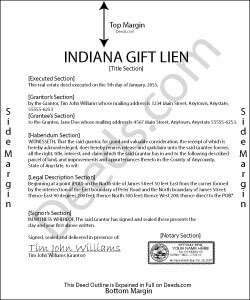 In Indiana, there is no state gift tax, but gifts of real property are subject to the federal gift tax. The person or entity making the gift (grantor or donor) is responsible for paying the federal gift tax; however, if the donor does not pay the gift tax, the donee (grantee) will be held liable . For questions regarding state and federal tax laws, consult a tax specialist. In accordance with federal law, individuals are permitted an annual exclusion of $14,000 on gifts. This means that gifts valued below $14,000 do not require a federal gift tax return (Form 709). If the gift's value could possibly be disputed by the IRS, a donor may benefit from filing a Form 709 . This article is provided for informational purposes only and is not a substitute for the advice of an attorney. Contact an Indiana lawyer with any questions about gift deeds or other issues related to the transfer of real property. Ralph E. said: I wish I had found this site earlier!!! Not only was it helpful and just what I needed but I got my information so fast AND on the weekend. I would recommend this site to everyone. I plan on using it more. Its cheap and I can get my information while sitting at home. Very impressed! Reply from Staff: Thank you for the kinds words Ralph. Have a great day! Joseph L. said: Very easy to fill out and and saved a lot of extra cost by doing it ourselves and getting it notarized. Reply from Staff: Thank you Joseph, we really appreciate your feedback. donald h. said: very informative and thank everyone involved,my deed needed to be changed and will adjusted.